This portiere tapestry "Caroline Gold" shows a decorative design based on French 17th century portieres. 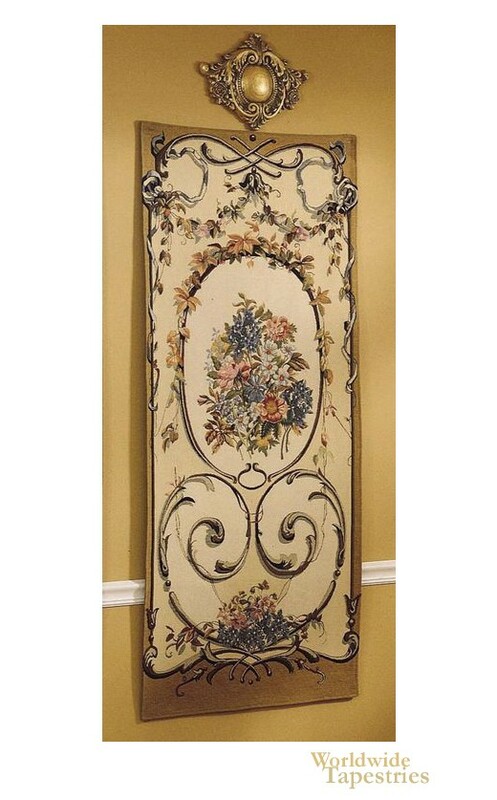 This wall decor of the portiere was used as decoration to adorn walls of chateaus and homes, and here we see a gorgeous design of flowers and foliage inspired curlicues and spirals which decorates the piece beautifully. The outer border color is in earth gold. This art tapestry "Caroline Gold" is backed with a lining and has a tunnel for easy hanging. Note: tapestry accessories, where pictured, are not included in the price.